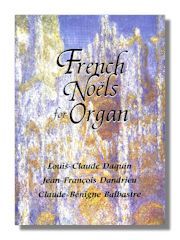 French Noëls for Organ. Louis-Claude Daquin, with Dandrieu, Balbastre. Dover Publications. 1997. ISBN 0486296962 (paperback). A treasury of carols from the 18th Century. Represented are pieces by Daquin, Dandrieu, Balbastre. All except Daquin can be played on any keyboard instrument. Piano Music. Claude Debussy, with Beveridge Webster (Editor). Dover Publications. 1973. ISBN 0486227715 (paperback). 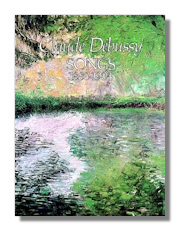 Debussy's piano music from 1888 to 1905, complete collection. Contains: Deux Arabesques, Mazurka, Suite Bergamasque, Valse Romantique, Rêverie, Masque, Danse, L'Isle Joyeuse, Ballade, Images/Book I, Pour le piano; D'un cahier d'esquisses; Estampes. In each case the music as been reproduced photographically from original or early editions. Designed for years of use at the piano, the book features large and clearly printed noteheads and margins and spaces adequate for written notes. It opens flat and binding will not crack or split. Complete Preludes for Solo Piano. Claude Debussy. Dover Publications. 1990. ISBN 0486259706 (paperback). Russian edition reprint, unabridged, with glossary of French terms. Books I & II complete in one volume. 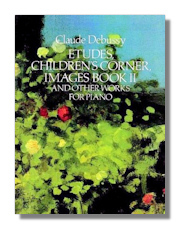 Études, Children's Corner, Images Book II & Other Works for Piano. Claude Debussy. Dover Publications. 1992. ISBN 0486271455 (paperback). 12 Études from 1915, Children's Corner (including Golliwogg's Cake Walk), Images, Book II (including Cloches a travers les feuilles; Et la lune descend sur le temple wqui fut & Poissons d'Or); Nocturne, Pièce pour piano, Hommage a Haydn, The Little Nigar, La plus que lente, Berceuse Héroïque, Six &eacupigraphes antiques, Elégie. Preludes, Book 1. Claude Debussy. Dover Publications. 1987. ISBN 0486255492 (paperback). 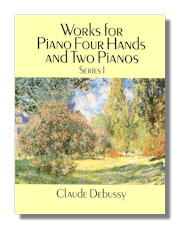 Works for Piano Four Hands & Two Pianos, Volume 1. Claude Debussy. Dover Publications. 1992. ISBN 0486269744 (paperback). Volume I contains Petite Suite (piano four hands); Prelude a l'Après-midi d'un Faune (two pianos); Printemps (piano four hands); Six Epigraphes Antiques (piano four hands). 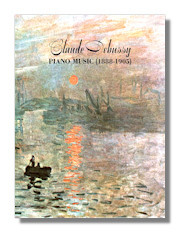 Reprinted from authoritative French editions, these works, ranging widely in mood, display the brilliant pianism at the heart of Debussy's musical imagery. Works for Piano Four Hands & Two Pianos, Volume 2. Claude Debussy. Dover Publications. 1992. ISBN 0486269752 (paperback). Volume II contains Marche Ecossaise sur un Thème Populaire (piano four hands); Danse Sacrèe et Danse Profane (two pianos); La Mer (piano four hands); En Blanc et Noir (two pianos); Prelude, Cortege et Air de Danse from LEnfant Prodigue (piano four hands). Songs, 1880-1904. Claude Debussy. Dover Publications. 1981. ISBN 0486241319 (paperback). Thirty-six songs for voice & piano, with texts by Baudelaire, Verlaine, Mallarmé, Bourget, Louÿs, others. Songs include Cinq poèmes de Baudelaire, Trois chansons de Bilitis, Proses lyriques (text by the composer,) Fêtes galantes, I & II, Deux romances, Ariettes Oubliées, Trois chansons de France, Trois Mélodies. Cello Sonata, Violin Sonata & Sonata for Flute, Viola & Harp. Claude Debussy. Dover Publications. 1993. ISBN 0486278131 (paperback). Composer's last three chamber works, written between 1915 and 1917. The Cello Sonata is rich in unconventional, sometimes surrealistic effects. The Violin Sonata integrates jazz influences with impressionism. The Sonata for Flute, Viola and Harp sparkles with spontaneity and innovation. All are sonatas of individual charm and definite 20th-century character; all reproduced from authoritative French editions. Score form. No individual parts in this edition. Cello Music by French Composers. Claude Debussy, with François Couperin, Marin Marais, Louis de Caix d'Hervelois, Jules Massenet, Camille Saint-Saëns, Gabriel Fauré, Edouard Lalo, Otto Deri (Editor). G. Schirmer, Inc. 1986. ISBN 0793552230 (paperback). 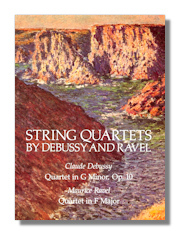 String Quartets by Debussy & Ravel. Maurice Ravel, with Claude Debussy. Dover Publications. 1986. ISBN 0486252310 (paperback). Superb one-volume edition of two influential compositions noted for individuality, unique interpretations of the medium, delicate and subtle beauties: Debussy's Quartet in G Minor, Op. 10 and Ravel's Quartet in F Major. Based on authoritative French editions, this clearly printed volume is sturdily bound for long life on the music stand. Prelude to "the Afternoon of a Faun". Claude Debussy, William W. Austin. W.W. Norton & Company. 1970. ISBN 0393099393 (paperback). An authoritative score including Mallarmé's poem, backgrounds and scores, criticism and analysis. Three Great Orchestral Works in Full Score. Claude Debussy. Dover Publications. 1983. ISBN 0486244415 (paperback). Contents: Prélude à l'après-midi d'un faune, Nocturnes,and La Mer. 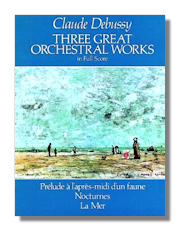 Complete scores of three orchestral favorites by vastly influential modern composer. Among the most popular, most recorded, most performed works in the repertoire. Innovation, texture, shimmering impressionism. Reprinted from early French editions. New Contents, glossary of French musical terms. La Mer (the Sea): Three Symphonic Sketches. Claude Debussy. Dover Publications. 1997. ISBN 0486298485 (paperback). A complex and hypnotic masterpiece of orchestral texture, La Mer (The Sea) features marvelously fluid rhythm and shimmering evocations of light, color and the sea itself. This miniature-score version is an unabridged republication of an authoritative French edition. Students and music lovers will find it a convenient and inexpensive choice for use in the classroom or concert hall. Images, Jeaux & the Martyrdom of St. Sebastian (Suite) in Full Score. Claude Debussy. Dover Publications. 1992. ISBN 0486271013 (paperback). 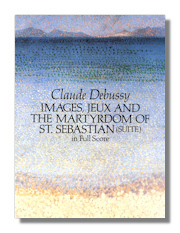 Images is the orchestral triptych that contains Debussy's "Ibéria." The Martyrdom of St. Sebastian consists of four excerpts: "La Cour des Lys," " Danse Extatique et Final du 1er Acte," "La Passion" & "Le Bon Pasteur.". Pelléas et Mélisande in Full Score. Claude Debussy. Dover Publications. 1985. ISBN 0486248259 (paperback). Debussy's only opera is a perfect marriage of music and verse and one of the great landmarks in the history of the form. Reprinted from the E. Fromont (1904) edition, this volume reproduces the full orchestral-vocal score in a clear, modern engraving. Brigg Fair & Other Orchestral Works. Frederick Delius. Dover Publications. 1997. ISBN 0486298515 (paperback). Full scores for these works: Brigg Fair, The Song of the High Hills, a Dance Rhapsody, In a Summer Garden, Summer Night on the River & On Hearing the First Cuckoo in Spring. Reproduced from original scores. Lucia Di Lammermoor in Full Score. Gaetano Donizetti. Dover Publications. 1992. ISBN 0486271137 (paperback). Donizetti's most popular opera, considered by many to be the paradigm of Italian Romantic opera – brimming with melody, lyrical expressiveness and bravura singing passages, a brilliant showcase for singers capable of the technical refinements of bel-canto singing. Reprinted from an authoritative Italian edition. The Lute Songs of John Dowland. John Dowland, with David Nadal (transcription). Dover Publications. 1997. ISBN 048629935X (paperback). The original first & second books, including Dowland's original tablature, transcribed for voice & Guitar by David Nadal. Forty-three transcriptions for voice & guitar, plus two dances for solo guitar. Complete song texts. 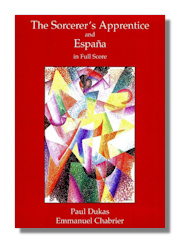 Dukas' "The Sorcerer's Apprentice" & Chabrier's "España" in Full Score. Paul Dukas. Dover Publications. 1997. ISBN 0486298264 (paperback). Musicians and music lovers will applaud this convenient one-volume compilation of a pair of perennial concert favorites. The Sorcerer's Apprentice, a gripping masterpiece of modern music, is coupled with España, a spirited rhapsody based on original Spanish airs. Reproduced from authoritative French editions. Instrumentation. Piano Sonata in E Flat Minor (Kalmus Edition) in Full Score. Paul Dukas. Alfred Publishing Company. 1985. ISBN 0769267858 (paperback). Complete Songs for Voice & Piano. Henri Duparc. Dover Publications. 1995. ISBN 0486284662 (paperback). Score. Settings of poems by Baudelaire, Leconte de Lisle, Théophile Gautier & others, composed between 1868 & 1884. Sixteen songs & one duet (La Fuite for soprano & tenor) reprinted from French editions with texts newly translated into English. Overture in D Major, overture in F Major. Josep Duran, with Anna Cazurra (Editor). Tritó Edicions. 1995. ISBN 8488955022 (paperback). These two overtures are the only known instrumental works by Josep Duran, born in Cadaqués in the 18th c. Duran was one of the main composers to introduce the Italian style in the Iberian Peninsula. Humoresques & Other Works for Solo Piano. Antonín Dvořák. Dover Publications. 1995. ISBN 0486283550 (paperback). 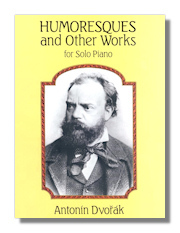 Thirty works by Dvořák for solo piano: Humoresques, Op. 101 (8 pieces); silhouettes, Op. 8 (12 pieces); Slavonic Dances arranged for solo piano by composer (4 pieces); Poetic tone pictures (4 pieces); Theme with Variations, Op. 36; Furiant in D Major. Reprinted from authoritative editions. 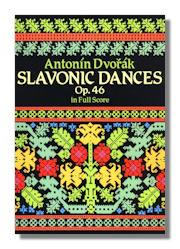 Complete Slavonic Dances for Piano Four Hands. Antonín Dvořák. Dover Publications. 1992. ISBN 048627019X (paperback). Both series of famous piano duets, unabridged. 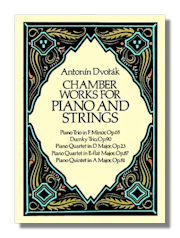 Chamber Works for Piano & Strings. Antonín Dvořák. Dover Publications. 1988. ISBN 0486256634 (paperback). 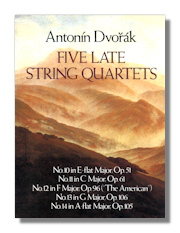 Five Late String Quartets. Antonín Dvořák. Dover Publications. 1986. ISBN 0486251357 (paperback). Study scores for Quartet #10 in E-flat Major, Op. 51; #11 in C Major, Op. 61; #12 in F Major, Op. 96, the "American"; #13 in G Major, Op. 106 & #14 in A-flat Major, Op. 105. Scores reproduced directly from reliable N. Simrock editions, Berlin, 1879-96. Violin Concerto in A Minor, Op. 53 & Romance for Violin and Orchestra in F Minor, Op. 11 in Full Score. Antonín Dvořák. Dover Publications. 2006. ISBN 0486449645 (paperback). 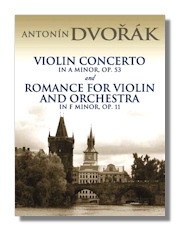 Together for the first time in a single affordable volume, these are authoritative editions of the Violin Concerto in A minor, which broke the centuries-old mold of the concerto form, and the Romance for Violin and Orchestra, a mesmerizing reverie that builds to a finale of fiery technical feats. Great Romantic Cello Concertos in Full Score. Antonín Dvořák, with Schumann & Saint-Saëns. Dover Publications. 1983. ISBN 0486245845 (paperback). Slavonic Dances, Op. 46 in Full Score. Antonín Dvořák. Dover Publications. 1987. ISBN 0486253945 (paperback). 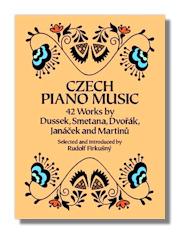 A masterwork of the great Czech composer, one of the most popular in the orchestral repertoire, reprinted from an authoritative Czech edition. Symphonies #4 & 5 in Full Score. Antonín Dvořák. Dover Publications. 2007. ISBN 0486464385 (paperback). The Czech composer demonstrates his mastery of the orchestral form in Symphony #4 in D Minor, with its pronounced Wagnerian influences, and the markedly contrasting Symphony #5 in F Major, a work of pastoral beauty. These mainstays of the orchestral repertoire appear here in authoritative Simrock editions. Symphonies #6 & 7 in Full Score. Antonín Dvořák. Dover Publications. 1994. ISBN 0486280268 (paperback). 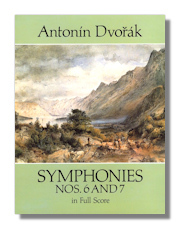 Two of the composer's finest symphonies, reproduced from the authoritative Simrock edition. 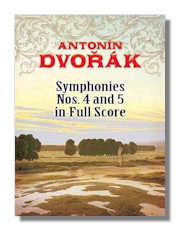 Symphony #6 in D is rich in themes, imbued with nationalistic coloring. Symphony #7 in D Minor, considered by many his greatest achievement in the form, offers strong, concise development, great emotional depths and heroic spirit. 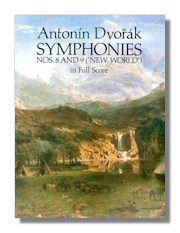 Symphonies #8 & 9 "From the New World" in Full Score, Antonín Dvořák. Dover Publications. 1984. ISBN 048624749X (paperback). Two celebrated symphonies by the great Czech composer, the Eighth and the immensely popular Ninth, "From the New World" in one volume. Symphony #9 in E Minor "From the New World", Op. 95. Antonín Dvořák. Dover Publications. 1997. ISBN 0286298922 (paperback). Miniature Score. Unabridged from authoritative Simrock edition.